VLD, CD&V, Groen!, N-VA, Ind. 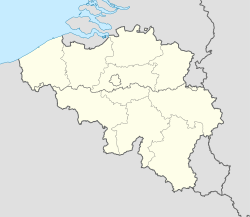 Mechelen (Dutch pronunciation: [ˈmɛxələ(n)] ( listen), French Malines, tradeetional Inglis Mechlin[n 1]) is a ceety an municipality in the province o Antwerp, Flanders, Belgium. ↑ Mechelen haes been kent in Scots an Inglis as Mechlin, frae whaur the adjective 'Mechlinian' is derived. This name mey still be uised, especially in a tradeetional or heestorical context. The ceety's French name Malines haed an aa been uised in Scots an Inglis in the past (in the 19t an 20t century) houever this haes largely been abandoned. Meanwhile, the Dutch derived Mechelen began tae be used in Scots an Inglis increasingly frae late 20t century onwards, even while Mechlin remained still in uise (for example a 'Mechlinian' is an indwaller o this ceety or someone seen as born-an-raised there; the term is an aa the name o the ceety dialect; as an adjective 'Mechlinian' mey refer tae the ceety or tae its dialect. This page wis last eeditit on 29 Juin 2017, at 17:20.